Bazzana, Kevin et al. "Glenn Gould". The Canadian Encyclopedia, 25 September 2017, Historica Canada. https://www.thecanadianencyclopedia.ca/en/article/glenn-gould. Accessed 18 April 2019. Glenn Herbert Gould (born Gold), pianist, broadcaster, writer, composer, conductor, organist (born 25 September 1932 in Toronto, ON; died 4 October 1982 in Toronto, ON). Portrait by Yousef Karsh. Credit: \u00a9 Estate of Yousef Karsh/Library and Archives Canada /e010752249. Glenn Herbert Gould (born Gold), pianist, broadcaster, writer, composer, conductor, organist (born 25 September 1932 in Toronto, ON; died 4 October 1982 in Toronto, ON). A celebrated pianist and prolific broadcaster, Glenn Gould was one of Canada's most important cultural figures, and remains one of the world's most admired and studied musicians. Gould’s distinctive piano style, idiosyncratic interpretations, unusual stage mannerisms and independent vision marked him as a maverick and an eccentric. He favoured structurally intricate music over the early-Romantic and Impressionistic works at the core of the standard piano repertoire, preferring Elizabethan, Baroque, Classical, late-Romantic and early-twentieth-century music. He was most renowned for his interpretations of the keyboard music of J.S. Bach. An intellectual performer with a gift for clarifying counterpoint and structure, his playing was also deeply expressive and rhythmically dynamic. He had the technique and tonal palette of a virtuoso, but refuted many conventions and disdained live performance. He wrote extensively about music and technology, and created great controversy by retiring from live performance at age 31 to pursue studio recordings and broadcasting projects. Glenn Gould was raised in the Beach neighbourhood of Toronto (the city has designated his childhood home a historic site), with long sojourns at his family’s cottage near Lake Simcoe. Both his parents sang. His father, a furrier, played the violin as a child, and his mother — whose grandfather was a cousin of the Norwegian composer Edvard Grieg — played the piano, and gave piano and voice lessons. At age three, Gould was discovered to have perfect pitch (the ability to identify or reproduce any isolated tone). At four, he began piano lessons with his mother and at five he made his first documented public appearance, on 5 June 1938, at a church in Uxbridge, ON, accompanying his parents, who sang a duet. He was tutored at home by his mother (1938–39), then attended Williamson Road Public School (1939–45) and Malvern Collegiate Institute (1945–51), though he did not graduate from the latter. 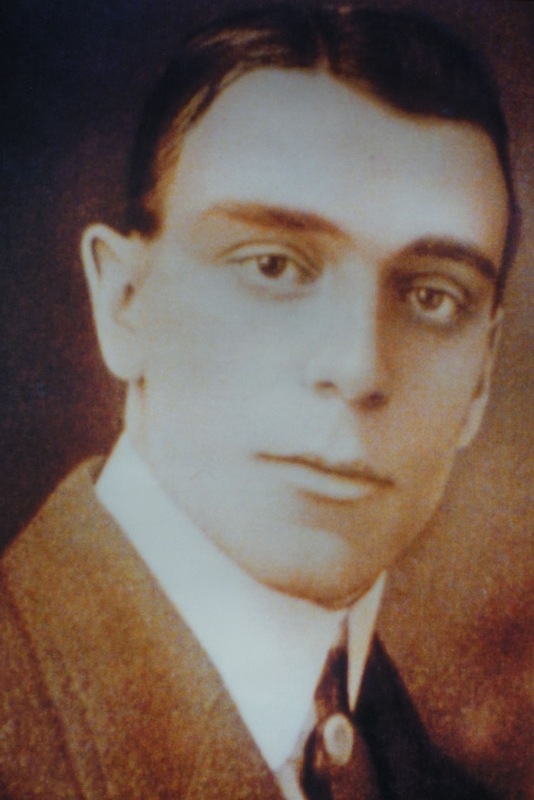 In response to the anti-Semitism prevalent in Canada in the late 1930s, his parents changed the spelling of their surname from “Gold” to “Gould,” to clarify their Anglo-Protestant heritage and to prevent being mistaken as Jewish. In 1940, Gould was enrolled at the Toronto Conservatory of Music (TCM; now the Royal Conservatory of Music), where he studied music theory, harmony and counterpoint with Leo Smith (1942–46), and organ with Frederick C. Silvester (1942–49). Gould’s organ studies gave him an early appreciation of the music of J.S. Bach. He performed mostly at church and school functions until 1944, then competed successfully in Kiwanis Music Festivals (1944–46). He passed his ATCM (Associate of the Toronto Conservatory of Music) piano exam at age 12 and his written exams a year later. Gould was among the first generation of Canadian concert musicians to receive their musical training entirely in Canada. A significant milestone in Gould’s musical education was his tutelage under the Chilean pianist Alberto Guerrero at the TCM (1943–52). Guerrero ingrained in Gould the repertoire and finger technique for which he became celebrated. Gould exhibited tremendous talent and proficiency as a pianist, but his life was not that of a child prodigy. His public appearances with the TCM and the Kiwanis festivals earned him his first serious attention as a pianist. He participated in his first radio broadcast (for CFRB, on 10 March 1945) with other Kiwanis Festival winners, and gave his first full solo piano recital at the TCM on 10 April 1945. He also composed music avidly from early childhood. He wrote both tonal pieces (based on a major or minor musical key), and atonal pieces (music not based on a particular key), as well as 12-tone idioms (music based on the 12 chromatic tones within an octave; see serialism). He showed a preference for highly organized, contrapuntal forms (music with more than one simultaneous melodic line). From age five through his late teens, he occasionally performed his compositions in public. He also gave some public performances on the organ until 1948; in fact, his professional debut was as an organist at a 1945 Christmas concert at the Eaton Auditorium. As a pianist, he first appeared with an orchestra on 8 May 1946 at Massey Hall, playing the first movement of Beethoven's Concerto No. 4 with the TCM orchestra, conducted by Ettore Mazzoleni. On 14 and 15 January 1947, he performed the entire concerto with the Toronto Symphony Orchestra, conducted by Bernard Heinze, in a concert for secondary school pupils. He gave his first professional recital shortly after his 15th birthday, on 20 October 1947, at the Eaton Auditorium. This performance marked the beginning of his long association with concert manager Walter Homburger, which lasted until 1968. In these early performances Gould was praised for his prodigious technique but also for beauty of tone, subtlety and delicacy of phrasing, a "poetic" temperament, and a depth of expression and interpretive wisdom well beyond his years. He performed on the piano throughout his teens at various Toronto venues — concert halls, the TCM, Hart House, the Art Gallery of Ontario, the Canadian National Exhibition — and occasionally elsewhere in Ontario. Gould made his CBC Radio debut on 24 December 1950, playing Mozart's Sonata K. 281 and Paul Hindemith's Sonata No. 3 on a piano with a heavy, dark bass. While preparing the recording of the performance for broadcast, he experienced something of an epiphany. He found that by suppressing the bass and boosting the treble, he could make the piano sound the way he had failed to do during his performance. His realization that, through technology, he could overcome the piano's limitations and improve upon his original result would fundamentally influence his attitudes and approach to performance and recording. In January 1951, he organized an ambitious "Recital of Contemporary Music" at the Royal Conservatory of Music and, with schoolmate Robert Fulford, formed the company New Music Associates, which held three concerts in Toronto in 1952 and 1954. He undertook his first Western Canadian tour (of Vancouver and Calgary) in 1951, and later made debuts in Montréal (1952), Ottawa (1953), the Maritimes (Saint John, 1953) and Winnipeg (1954). He appeared at the inaugural Stratford Festival in 1953 as part of the Festival Trio, a chamber group with violinist Albert Pratz and cellist Isaac Mamott, and returned to the Festival often in the following years. Pianist Glenn Gould sculpting sound with his free hand, circa 1950s (courtesy Toronto Star). 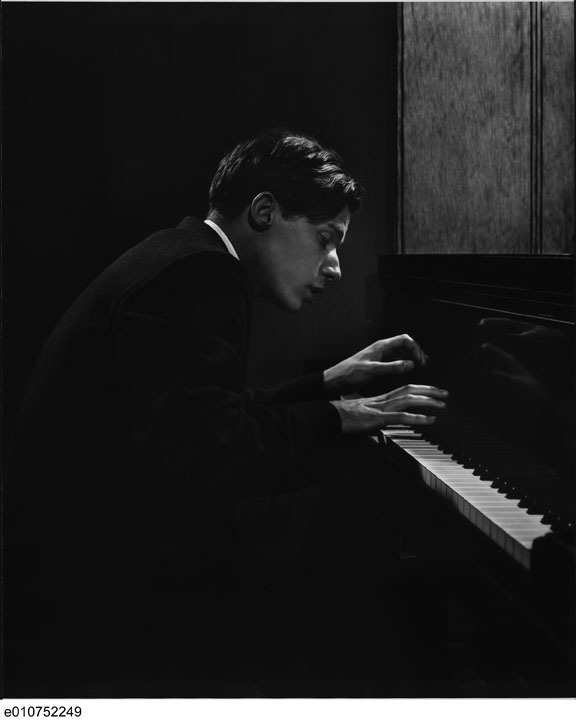 By the time Gould was 20, the unconventional repertoire characteristic of his adult concerts was established: a little 16th- and 17th-century music, a great deal of Bach, a very select group of Classical and Romantic works, and a generous selection of mostly Austro-German 20th-century music, including the complete piano works of Arnold Schoenberg, Alban Berg and Anton Webern. He performed few of the early-Romantic and Impressionistic works at the core of the piano repertoire at the time. Through the early 1950s, Gould appeared often in solo recitals, chamber music and concertos on CBC Radio (a program on 21 December 1953 included the Canadian premiere of Schoenberg's concerto). He was also a featured performer in the first television program ever broadcast in English Canada on 8 September 1952. In 1953, Gould’s father customized a chair for him by sawing four inches off the legs of a folding bridge chair and making each leg individually adjustable. Gould insisted on using the chair for every concert and recording from then on, even after the padded seat was worn through, preferring its lower height (14 inches off the floor) to the standard-height piano bench (20 inches off the floor) employed by most pianists. He made his first studio recordings in November 1953 for the Canadian label Hallmark. His performance on CBC TV on 16 December 1954 is his earliest surviving television appearance. On 2 January 1955, Gould made his American debut at the Phillips Gallery in Washington, DC, and on 11 January played in Town Hall, NY, both times in a program of music by Orlando Gibbons, Jan Pieterszoon Sweelinck, Bach, Webern, late Beethoven and Berg. The morning after the New York recital, he was offered a contract by Columbia Masterworks (later CBS Masterworks and Sony Classical, now Sony Masterworks), for which he recorded for the rest of his life. His first Columbia recording, a brilliantly virtuosic and highly original reading of Bach's Goldberg Variations, recorded in June 1955 and released in January 1956, was enthusiastically received, and immediately brought him international attention. For the next nine years, Gould toured annually throughout North America. Highlights included a performance at Massey Hall on 16 April 1956, at which he received an engraved watch from the City of Toronto. His only major composition, the long, one-movement String Quartet (written 1953–55), was first performed by the Montréal String Quartet on CBC's French radio network on 21 May 1956. The work is a synthesis of Baroque fugue, Classical sonata form, Richard Strauss's late-Romantic harmony and Schoenberg's "developing variation." Gould made his formal conducting debut on CBC TV’s Chrysler Festival on 20 February 1957. In May of that year, he made his European debut as a pianist with a two-week concert tour of Moscow and Leningrad (making him the first Canadian musician, and the first North American pianist, to play in the Soviet Union after the Second World War), followed by performances with the Berlin Philharmonic under conductor Herbert von Karajan, and a recital at the Vienna Festival. On 26 September 1957, Gould conducted the CBC Vancouver Orchestra in symphonies by Mozart and Schubert, broadcast nationally on CBC Radio. Another highlight of this period includes his recital at Carnegie Hall on 7 December 1957. He returned to Europe the following two summers. In 1958, he appeared at the Salzburg Festival and, with the Hart House Orchestra under Boyd Neel, at the Brussels World's Fair. He also performed that year in Sweden, Germany and Italy, made his Boston debut in the Peabody Mason Concerts, gave 11 performances in 18 days in Israel, and gave concerts and lectures at the Vancouver International Festival (1958, 1960–61). In 1959, he gave a recital in Berlin, made his London debut in a Beethoven cycle with the London Symphony Orchestra under Josef Krips, gave two recitals for the BBC, and appeared at the Salzburg and Lucerne Festivals. In 1959, he received the Harriet Cohen Bach Medal for Pianists, a British-based prize. He again appeared at New York’s Carnegie Hall on 13 February 1959. On 6 and 7 December 1960, he gave the first public performances in Canada of Schoenberg's piano concerto. Gould, the cellist Leonard Rose and the violinist Oscar Shumsky were artists-in-residence at the Stratford Festival in 1960, and later served as the Festival's co-directors of music (1961–64). Some of Gould’s most notorious performances were of Brahms's D minor Concerto with Leonard Bernstein conducting the New York Philharmonic (5, 6, 8 April 1962). Bernstein delivered a pre-concert speech to the audience noting his disagreement with Gould's interpretation, which featured unusually slow tempos, departures from Brahms's dynamic and phrase markings, and the highlighting of counterpoint and motives. Gould had wide-ranging musical and intellectual interests, and never wanted to be limited to the life of a concert pianist. He had ambitions to conduct and compose, and from his late teens demonstrated gifts as a writer on musical subjects. The range of his talents and interests was widely admired. During his concert years, he continued to record prolifically for Columbia, to write and lecture, and to perform on CBC Radio and TV. He made his first radio documentary, on Schoenberg, in 1962, and delivered a dozen lectures from 1963 to 1964, most of which have been published. Increasingly attracted to his work in the electronic and print media, Gould decided to give up the life of a concert pianist to devote himself to recording, broadcasting, composing and writing. At the height of his fame and creative powers, he gave his last live concert performance on 10 April 1964 at the Wilshire Ebell Theatre in Los Angeles. While Gould's live concert career wound down, his radio and TV recitals and documentaries were becoming more innovative and sophisticated as he explored beyond the limits of the conventional broadcast recital. In the early 1960s, he began giving radio and TV recitals that were unified thematically or tied together with his own spoken commentary. He also became prolific as a writer, exploring many musical and non-musical topics in liner notes, periodical articles, reviews, scripts and interviews. gould was one of the most brilliant and complex musicians of the 20th century. shown here in rehearsal, 1974 (photo by walter curtin, courtesy library and archives canada/pa-137052). the music is an excerpt from bach's Goldberg Variations, Variation 19 (recorded 21 June 1954, courtesy CBC). However, he never realized his plan to devote himself largely to composition after his retirement from concert life; despite ambitious plans and sketches for chamber and orchestral music, songs, and opera, his serious composing effectively ceased after 1964. He did notate or record some of his transcriptions (versions re-written for piano), including three of orchestral music by Wagner, and one of Ravel's own transcription of La Valse. Increasingly, Gould sought other ways to express himself away from the piano. He created many programs in which he did not perform but instead explored musical topics that interested him, such as recording and broadcasting, the "psychology of improvisation," aleatoric music (music composed randomly, e.g., by rolling dice), and the Moog synthesizer. His innovations were rewarded with the Canadian Confederation Medal in 1967 and the Canada Council for the Arts' Molson Prize in 1968. From the late 1960s forward, his compositional ambitions were channeled into the production of what he called "contrapuntal radio documentaries," evocative tapestries of speech, sound effects and music that drew on principles and techniques from radio documentary, radio drama, film and music. The programs known as his "Solitude Trilogy" — The Idea of North (1967); The Latecomers (1969), about Newfoundland; and The Quiet in the Land (1977), about the Mennonites of Manitoba — explored the effects of geographical, cultural, and religious isolation on individuals and communities. In 1970, he declined a nomination to the Order of Canada and moved his recording operations to Toronto from New York. He composed the music for the feature film Slaughterhouse-Five (1972) and won the only Grammy award in his lifetime for Best Classical Album Notes for his 1973 album Hindemith: Sonatas for Piano. During this period, Gould also created four major documentaries on musicians: conductor Leopold Stokowski (1971); cellist Pablo Casals (1974); and composers Arnold Schoenberg (1974) and Richard Strauss (1979). Among the most important CBC TV productions of Gould’s later years were a documentary portrait in the series Telescope (1969), his technologically experimental special The Well-Tempered Listener (1970), his series Music in Our Time (1974–77) and the documentary “Glenn Gould's Toronto” in the Cities series (1979). He was also involved in several important productions abroad including: the CBC-BBC co-production Conversations with Glenn Gould (1966); the NET special How Mozart Became a Bad Composer (1968); a series of four films for the French television (ORTF) series Chemins de la musique (1974), with Bruno Monsaingeon; Gould’s self-produced video production Radio as Music (1975); and Glenn Gould Plays Bach, a series of three films directed by Monsaingeon (1979–81). In 1976, Gould was awarded the Diplôme d'honneur from the Canadian Conference of the Arts, and the University of Alberta's National Award in Music. In 1977, one of his recordings of the Prelude and “Fugue in C major” from Book II of Bach’s The Well-Tempered Clavier was included on a record that was placed in the Voyager spacecraft, as a representation of human civilization and intelligence. In 1979, he won the Juno Award for Best Classical Album of the Year for Hindermith; Das Marienleben. He received the Canadian Music Council Medal and the Canadian Music Council's Grand prix du disque in 1981. As he approached age 50, Gould was planning to phase out his career as a recording pianist while fulfilling ambitious plans to make recordings as a conductor. He made his first and only official recording as a conductor (Wagner's Siegfried-Idyll) in the summer of 1982. He also arranged music for the feature film The Wars (1983). Gould planned to stop recording altogether around 1985, and devote himself to writing and composing. However, on 27 September 1982, a few days after his 50th birthday, and approximately a week after the release of a best-selling second recording of the Goldberg Variations, he suffered a massive stroke and died on 4 October 1982. Outside popular music, possibly no artist to date has expanded the technological possibilities of recorded music, or explored its aesthetic and even ethical implications, more than Gould. He believed that his performances were not just readings of pieces of music, but documents that reflected his entire world view. He thought (as had creators in the Romantic era) that artists had a "moral mission," and that art had enormous potential for the betterment of human life. Gould became a leading exponent among classical performers of a true philosophy of recording, which he passionately defended in articles and broadcasts, and practiced in dozens of albums for Columbia/CBS, developing a hands-on expertise in recording techniques. A studio performer, he felt, need not be concerned with projecting musical effects into an auditorium for the purpose of catching and holding the attention of an audience; rather, he could subject the music to minute inspection of detail at every structural level. Moreover, he could allow the technology itself — placement of microphones, splicing, overdubbing, reverb, etc. — to influence the interpretation and could defer many final interpretive decisions to the post-production process. For Gould, recording had fundamentally altered the traditional relationship of composer, performer and listener. He justified his interpretive experiments in part by arguing that there was no point in making yet another recording of, for example, the Emperor Concerto, without offering significant departures from conventional readings already available. Gould produced original, deeply personal, sometimes shocking musical interpretations, often employing extreme tempos, odd dynamics and even odder phrasing. He had a lifelong, controversial penchant for flouting conventional ideas about the piano and musical interpretation, perhaps exemplified by his fondness for detached articulation (playing without connecting the melody notes). His wide but highly selective repertoire ranged from Tudor-era virginalists (performed on a kind of harpsichord) to living Canadians and revolved mainly around Bach and Schoenberg, but was conspicuously light on early Romantic music. He championed esoteric and intellectually challenging modern musical idioms, and advocated obscure works by composers like Georges Bizet, Edvard Grieg, Richard Strauss and Jean Sibelius. He also had a fondness (rare in his day) for playing orchestral and operatic music in transcription. In particular, he offered a dynamic and influential example of the mid-20th-century "high-modernist" approach to the performance of Bach. Gould’s piano style — lean, refined, rhythmically dynamic, structurally explicit, insistently contrapuntal — was more modernistic than Romantic, though it could still be lyrical and deeply expressive in its own way. As an interpreter, however, he was the ultimate Romantic, often tinkering with the performance markings (occasionally even the notes). He sought fresh perspectives on works through extreme tempos, quirky phrasing and ornamentation, and other interpretive experiments. For these he was both praised for originality and condemned for eccentricity. During his concert days, Gould noted that European critics wrote about his interpretations, while those in North America wrote more about his eccentricities. In his later years, a growing Gould legend was fed by reports of his personal eccentricities and lifestyle. He lived modestly and alone (he never married), guarded his private life jealously, refused to make public appearances of any kind and rarely left Toronto (especially after 1970, when he moved his recording operations there). In recent years, information regarding Gould’s discreet romantic relationships have come to light, most notably his five-year affair (beginning in 1967) with the painter Cornelia Foss, wife of the American composer Lukas Foss, who left her husband and moved with her children to Toronto for several years to live near Gould. Some consider Gould to have been not merely eccentric but perhaps mentally ill. (A number of writers, most notably Dr. Timothy Maloney, have speculated that he suffered from Asperger's Syndrome, a mild form of autism that is compatible with high achievement.) His unusual habits included insisting on very warm room temperatures, always dressing in heavy layers and usually wearing gloves. He was concerned for his health to the point of hypochondria, took many medications and often avoided physical contact with others. His florid physical mannerisms (he often swayed and rotated his torso while playing), as well as his habit of vocalizing and humming while he played, also provoked much comment. Gould published dozens of pieces of writing on a wide range of subjects (not all of them musical), including articles, program notes for concerts, liner notes for more than 20 of his albums, lectures, reviews, letters to the editor and humour. He received a Grammy Award in 1973 for the liner notes he wrote for his album Hindemith: Sonatas for Piano. He wrote prolifically about recording and the mass media, his ideas often harmonizing with those of his friend Marshall McLuhan. Gould’s writings on the electronic media remain relevant, in some cases visionary. Figuring in the scripts he wrote for his radio, TV and film productions, the result is an impressive body of writing that, while uneven and often controversial, earned him a reputation as an informed, highly original and provocative thinker on music and technology. Five of Gould’s pianos have been preserved. CD 318, the 1943 Steinway grand piano he used in most of his recordings from 1960 to 1981, and which was also used by jazz pianist Bill Evans on his landmark 1963 album Conversations with Myself, is at the National Arts Centre in Ottawa. The two Yamaha grands Gould bought in his final years are housed at Roy Thomson Hall in Toronto, and Central United Church in Edmonton. The two pianos he kept in his apartment, a 1932 Steinway grand and an 1895 Chickering baby grand, are respectively at Rideau Hall in Ottawa, and the lobby of Glenn Gould Studio at the Canadian Broadcasting Centre in Toronto. Following Gould’s death, his famous folding chair, customized for him by his father, was displayed in a glass case in the music division at the National Library of Canada. It remained there until 2005, when it was transferred to a storage vault and brought out only for special events and exhibitions. Since June 2012, it has been on permanent display at the National Arts Centre in Ottawa, with Gould’s famous CD 318 Steinway. Gould enjoyed a reputation as one of the world's premier musicians, but his prolific work in the media, aside from concerts and recordings, was not readily accessible during his lifetime. As a result many people, for much of his career, knew him only as a pianist. Since 1982, however, his work has become increasingly accessible. His international following has greatly expanded, and a thriving cottage industry has grown up around him. Various studio recordings were digitally re-mastered and re-released soon after his death by CBS Masterworks, and many live and broadcast performances were released by smaller pirate labels in North America, Europe and Japan. Finally, from 1992 to 1997, Sony Classical released the comprehensive Glenn Gould Edition, comprised of more than 75 CDs, including many concert and broadcast recordings. CBC Records released eight Gould volumes on 11 CDs from 1992 to 1999, including many broadcast performances from the early 1950s. Gould's recordings continue to sell in impressive numbers; in fact, his recordings sell better today than when he was alive. The 1982 recording of the Goldberg Variations was certified gold in Canada in 1984, and achieved platinum sales status of 100,000 copies in 1992. Gould's radio and TV broadcasts and films have also been revived since his death. In 1987, the CBC began rebroadcasting the bulk of his TV work, edited into 24 half-hour programs titled Glenn Gould Plays. The series was also shown in Europe. His "contrapuntal radio documentaries" have been rebroadcast by the CBC and abroad, and most have been released by CBC Records. Sony Classical released a generous selection of TV performances from 1992–94 in the Glenn Gould Collection, comprised of 16 hour-long volumes on VHS and laserdisc. Gould's writings have been published in two major English-language collections and in some periodicals, and have been translated into many languages. His compositions, too, have enjoyed a minor revival since his death, receiving performances at Gould events and elsewhere around the world. In 1995, Schott Musik International undertook a comprehensive edition of Gould’s compositions and arrangements. 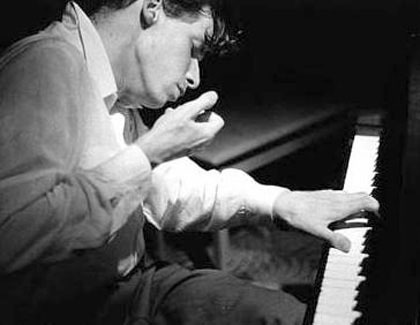 In 2011, CBC launched a website commemorating the 80th anniversary of Gould’s birth, and produced a set of DVDs, Glenn Gould on Television, the Complete CBC Broadcasts 1954–1977. The new availability of Glenn Gould's recordings, broadcasts, writings and compositions inspired a vast amount of writing on Gould, in many countries and languages. Today the Gould literature rivals that of classical performers as prominent as the conductor Arturo Toscanini. It ranges from hagiography to scholarship, biographies to reference books, general appreciations of his achievement to focused studies of almost every aspect of his life, personality, work and thought. Though still dismissed as a mere eccentric in some quarters, Gould is studied and even revered as an artist and thinker, particularly outside the English-speaking world, in countries like France, Germany, Russia, Israel and Japan. The CBC, National Public Radio in the US, the BBC, Japan's NHK, and all of the major European networks have produced posthumous portraits and other radio and TV programs about Gould. A Glenn Gould Society based in Groningen, Netherlands, was founded on 1 October 1982; it sponsored public events and published a semi-annual Bulletin until 1992. The Glenn Gould Foundation (GGF) was established in Toronto in 1983, and since 1987 has awarded a triennial $50,000 Glenn Gould Prize in Music and Communication. In 1995, the GGF established a Friends of Glenn Gould society and published a semi-annual magazine, GlennGould, until 2008. Interest in Gould has been intense enough to spawn major conferences analyzing his life and work: the Glenn Gould Colloquium, 13–15 October 1987, at l'Université du Québec à Montréal; the Glenn Gould Symposium, 13–15 May 1988, in Amsterdam (organized by the Glenn Gould Society); the Glenn Gould Conference in Toronto, 23–27 September 1992, organized by the GGF; the Glenn Gould Festival in Groningen, 2–4 October 1992, organized by the Society; and the Glenn Gould Gathering, at the Canadian Broadcasting Centre in Toronto, 23–26 September 1999, organized by the GGF. In addition, many smaller Gould events have been held in major cities. Gould has been honoured in works by an ever-expanding list of artists. He has inspired several transcriptions of the Goldberg Variations, as well as original compositions by Alexina Louie (O Magnum Mysterium: In Memoriam Glenn Gould, 1982), Christos Hatzis (The Go(u)ldberg Variations, 1992), Art Lewis (Homage to Glenn Gould, 1996) and others. He has inspired works by painters and sculptors, including the exhibition The Idea of North in New York in 1987. A life-sized statue by Ruth Abernethy of Gould seated on a park bench, located in front of the Canadian Broadcasting Centre in Toronto, was unveiled in 1999. An exhibit by photographer Don Hunstein — The Hunstein Variations: A Photographic Record of Glenn Gould 1957-1999 — has toured widely. Many choreographers have created dances inspired by Gould's image and personality or using his recordings. For example, Israeli choreographer Emanuel Gat's 2013 work The Goldlandbergs was based on material from the radio program The Quiet in the Land. A book of Gould-inspired poems, Northern Music, appeared in 2001. He has been featured in short stories by writers including Joy Williams, Lydia Davis, and Joyce Carol Oates, and in novels by Thomas Bernhard (Der Untergeher, 1983), Thomas Harris (The Silence of the Lambs, 1988), Richard Powers (The Gold Bug Variations, 1991), Joe Fiorito (The Song Beneath the Ice, 2002) and others. He inspired The Maestro, a novel for young people by Tim Wynne-Jones, and Anne Chislett's children's play Not Quite the Same. There have been dramatic works based on Gould in several countries — the most important, David Young's play Glenn, had its premiere in Toronto in 1992, played at the Stratford Festival in 1999, and has been produced overseas in translation. François Girard's Genie Award-winning experimental biopic, Thirty Two Short Films About Glenn Gould (1993), is structured to reflect the 32 parts of Bach’s Goldberg Variations and includes interviews with those who knew Gould. Ted Dykstra starred in John McGreevy’s play An Evening with Glenn Gould, which was performed in anniversary celebrations of Gould’s 75th birthday in Ottawa and Toronto in 2007. Also that year, a portion of Metro Square in Toronto, next to Roy Thomson Hall, was designated Glenn Gould Place. The principal repository of Glenn Gould materials is the Glenn Gould Archive at Library and Archives Canada (LAC) in Ottawa. In October 1983, the library (then called the National Library of Canada) acquired more than 200 boxes of Gould’s personal belongings from his estate, a wealth of material that included: compositions and arrangements; writings; tapes of radio programs; audio and video recordings; correspondences; business, financial and medical records; and various other materials. The papers have been microfilmed. Certain artifacts — such as clothing, motel-room keys, pens, knick-knacks, etc. — are stored at the Canadian Museum of Civilization in Gatineau, QC. The National Library of Canada mounted a major exhibition, Glenn Gould 1988, from April–September 1988; it subsequently travelled across Canada and to Tokyo. A smaller but immensely popular Gould exhibition was shown at the Canadian Cultural Centre in Paris in 1986 and later toured eight other European cities. Searchable databases, as well as a virtual exhibition, private audio recordings, bibliographies, writings, etc. can be accessed through LAC's website. The LAC main catalogue includes a comprehensive collection of more than 2,000 sources relating to Gould. There is a Glenn Gould Memorial Scholarship Fund at the University of Toronto and a Glenn Gould Professional School at the Royal Conservatory of Music. 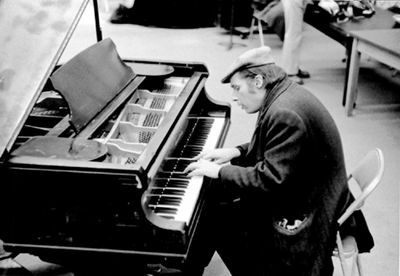 For a time there was an annual Glenn Gould Lecture in New York, and there have been college-level courses devoted to him in Canada and the US. There is a Glenn Gould Park in Toronto and a Glenn Gould Crescent in Uxbridge, and the City of Toronto has declared the house in which he grew up (32 Southwood Drive) to be a historic site. He was given a star on Canada’s Walk of Fame in 1998, and Canada Post issued a stamp in his honour in 1999. He is a popular figure on the Internet, the subject of fan sites, databases, discussion groups (most notably the F_Minor mailing list) and more. Some tributes to Gould have been ironic, most notably the 1985 International Bach Competition, held in Toronto 1–12 May 1985. The competition raised money for the GGF, but was criticized as inappropriate because Gould had strongly objected to music competitions and live performance. Similarly, the auditorium at the CBC's Canadian Broadcasting Centre is named Glenn Gould Studio. The 75th anniversary of his birth was honoured in 2007–08 with an exhibition at the Canadian Museum of Civilization, and the 80th anniversary in 2012 was celebrated around the world. Gould ranks high on lists of great musicians and great Canadians. When Maclean's magazine named its 100 most important Canadians in 1998, he ranked No. 1 among artists and No. 5 overall. His 1955 Goldberg Variations recording was inducted into the National Academy of Recording Arts and Sciences Hall of Fame in 1983; it was also among the first audio-visual artifacts to be inducted into Canada's Masterworks program in 2000, and was named by the magazine Gramophone as one of the 10 best recordings of the century. One encounters a wide range of opinions about Glenn Gould. Despite his relatively short concert career and 20-year truancy from the concert hall, and despite the absence from his repertoire of such mainstream piano composers as Schubert, Schumann, Mendelssohn, Chopin, Liszt, Debussy, Bartók and Stravinsky, he is widely considered one of the greatest (and certainly the most original and idiosyncratic) pianists of the 20th century, particularly in the music of Bach and of Gould's favourite 20th-century composers, such as Schoenberg and Berg. Gould also counted among his admirers many great performers, conductors and composers of his day. On the other hand, many musicians, critics, and aficionados have dismissed Gould vehemently. His musical interpretations and public pronouncements provoked considerable enmity, and some perceived him as a threat to many accepted views. The controversies continue, though he provokes less outrage today and his place among internationally renowned pianists seems to be solidifying. Many pianists — such as András Shiff, Evgeny Kissin, Peter Serkin, Ivo Pogorelić and Piotr Anderszewski — have acknowledged a debt to Gould's lean, refined, structurally explicit, contrapuntal style and to the creative freedom he demanded as an interpreter. Gould’s example encouraged later pianists to explore outside the standard piano repertoire. His nuanced championship of the music of Richard Strauss in the 1950s–60s, though it met with derision, is now recognized as prescient. Gould had some impact away from the piano as well. His writings on the electronic media remain relevant, in some cases visionary. Current thought on the premises, possibilities and ethics of recording is much indebted to him. His ideas resonate strongly in today’s world of digital technology, which was in its infancy when he died. His postmodernist advocacy of open borders between the roles of composer, performer and listener, for instance, anticipated digital technologies such as the internet, which democratize and decentralize the institutions of culture. His radio-documentary style also spawned many imitators. Gould has crept into the popular culture to a degree few classical musicians have. It is important to note that, at a time when many Canadian musicians needed to leave Canada to find success, Gould was always extremely well-received in Canada. His success at home presaged a new nationalist period in Canadian culture, and he found opportunities to be influential through Canada’s new and growing cultural institutions. Decades after his death, Gould continues to entertain and fascinate, challenge and provoke, as both a personality and artist. The very uniqueness that continues to attract new fans may limit his influence, since he was too idiosyncratic to breed literal imitators or lead a movement. It does however seem likely that he will remain a major presence in classical music. Certainly, he has proved to be one of the most important cultural figures Canada has produced. John McGreevy, ed, Glenn Gould: Variations (1983). Geoffrey Payzant, Glenn Gould: Music and Mind (1984). Tim Page, ed, The Glenn Gould Reader (1984). Jonathan Cott, Conversations with Glenn Gould (1984). Otto Friedrich, Glenn Gould: A Life and Variations (1989). Nancy Canning, A Glenn Gould Catalog (1992). Andrew Kazdin, Glenn Gould at Work: Creative Lying (1992). John P. L. Roberts & Ghyslaine Guertin, eds, Glenn Gould: Selected Letters (1992). Peter Ostwald, Glenn Gould: The Ecstasy and Tragedy of Genius (1997). Kevin Bazzana, Glenn Gould: The Performer in the Work (1997). John P. L. Roberts, ed, The Art of Glenn Gould (1999). Nicholas Hopkins, Glenn Gould's Goldberg Variations (2015). Glenn GouldSample Glenn Gould's recordings on iTunes. Glenn GouldAn informative website about the life and music of Glenn Gould. Features his biography, discography, photos, timeline, and more. From Sony BMG Music Entertainment. Kevin Bazzana & Glenn Gould's NotesMusic historian and biographer Kevin Bazzana shares a few insights into Glenn Gould's personal life in this brief video from pbs.org in the U.S.